Dan Gamaldi of Cradle of the Sun contacted us to share the installation of his entryway mosaic outside his shop in San Francisco. 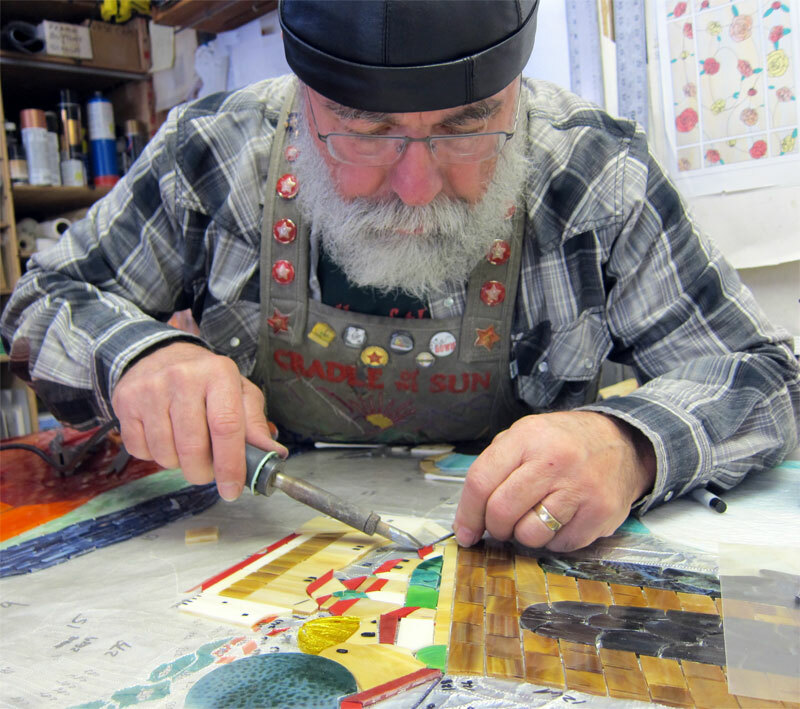 He underestimated the amount of time that it would take him to finish the mosaic, as he only worked on it in his “free” time; Dan generally works on commission stained glass windows for homes and offices in the Bay Area. Over a period of four years, he really got to know the ins and outs of working with No Days Mosaic Adhesive. The approach to creating the “Waterfall City” mosaic was different than I’ve heard of using before. 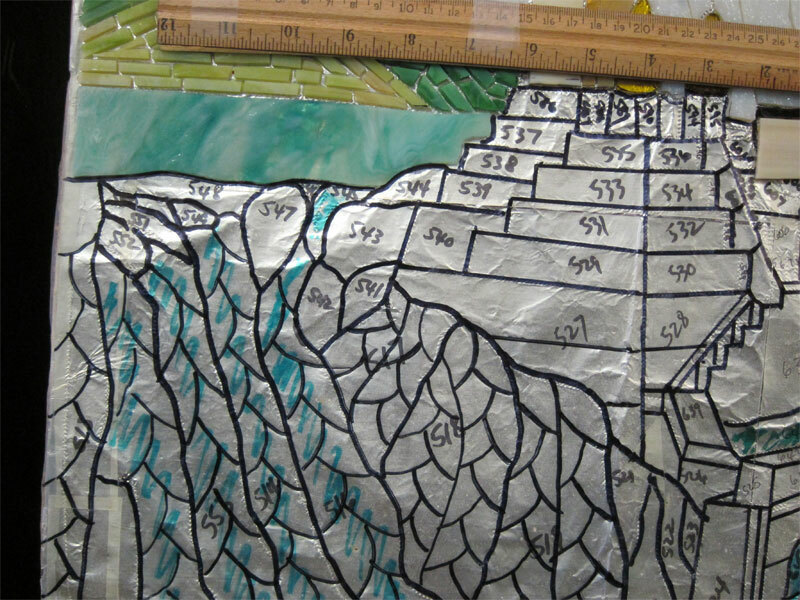 Instead of building on mesh, Dan used a base of aluminum foil prepped with No Days Mosaic Adhesive film. Many of the pieces of glass he used in his design (based on “Waterfall City” by James Gurney) were small, and Dan didn’t want to blow them away while heat setting the adhesive with a heat gun. So, he came up with several solutions. For very small pieces of glass, Dan heat set the adhesive using a soldering iron. 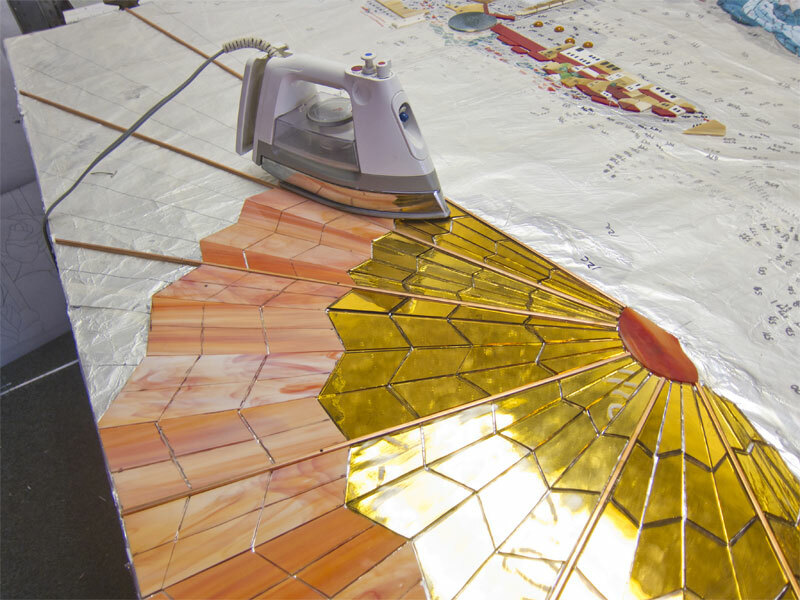 For heat setting small areas of the mosaic, he used an iron. and, finally, the No Days Curing Station to heat set larger areas of the mosaic. Using the irons and Curing Station allowed Dan to heat set portions of the mosaic without causing the adjacent adhesive to shrivel back on itself (which can happen when using a heat gun). 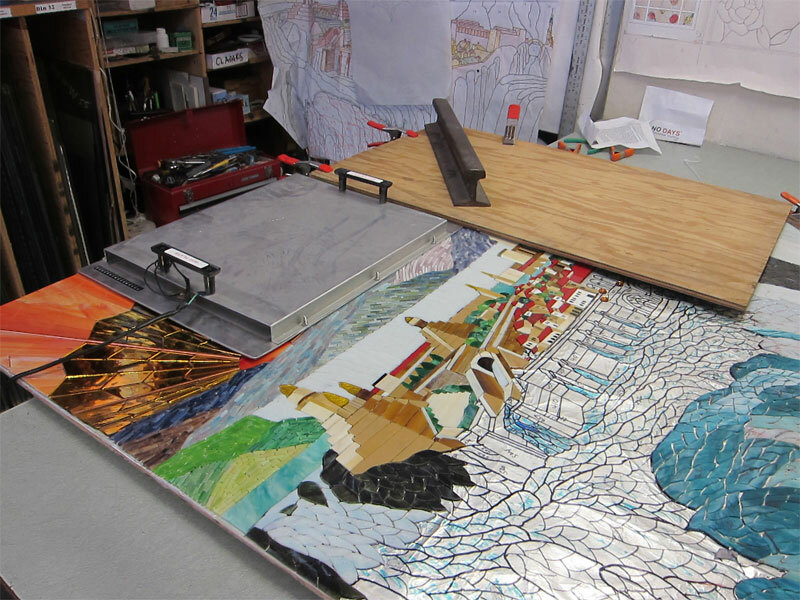 Dan used Streuter’s No Days Curing Station to heat set large areas of the mosaic all at once. Visit Dan’s website at Cradle of the Sun to see more pictures and read about the whole process. Below is the video of the mosaic being installed in the entryway of his shop. Beautiful beyond belief. The heating tips are really great–thanks. How beautiful a work or art it is. Love the tips given.